UNITED NATIONS, November 24 -- Among the qualifications to be a UN special envoy these days are being optimistic, distracted, conflicted or all three. 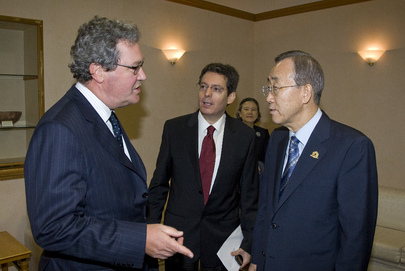 Alexander Downer, the former Australian diplomat named by Ban Ki-moon as his envoy on Cyprus, has kept up other jobs including a financial consultancy. He recently said he thinks Turkey wants a solution to the Cyprus issue, but he has been slow to say the least to respond to a naval dispute that seems to prove the contrary. Inner City Press: there are reports that the President of Cyprus has written to Ban Ki-moon about an incident in which the Turkish war vessel stopped them from “oil exploration off Cyprus”. One is, I want to know if the letter has been received, if the Secretary-General has any thoughts, and also if Mr. [Alexander] Downer thinks that this oil exploration is going to be helpful to the process he is involved in trying to resolve the Cyprus issue. Spokesperson: Let me check first if the letter was received. I am not aware of it. A letter was indeed received from the President of Cyprus on the subject that you raised. It is being studied. But studied by whom? Where is Alexander Downer? There is not a history of the Ban administration holding its envoys accountable. Tony Blair, for example, also has financial consultancies, including with JPMorgan Chase, and has done very little on his assignment in Gaza and the wider Middle East Quartet. The envoy on the FYROMacedonian "name issue," Matthew Nimetz, seems both distracted and conflicted. As Inner City Press reported earlier today, envoy Obasanjo is upbeat on the Congo, despite his conflict of interest about stealth deals with China, click here for that. Downer, where is Downer? Greece has lodged an "emergency demarche" with the Turkish government on November 5th, 2008, protesting against the overflights by Turkish air force planes over the island of Farmakonissi in the Aegean. Referring to the European Commission's progress report for Turkey, he pointed to a reference in the December 2007 European Council conclusions that called for the avoidance of any threat or action that could have a negative impact on good neighbor relations and efforts to peacefully resolve differences between Greece and Turkey. Greece has a coastal zone of 10 nautical miles serving aviation and air policing requirements as established by Presidential Decree 6/18, of September 1931 on the determination of the extent of territorial waters for aviation and air policing requirements, (Government Gazette A/ 325). Whereas for 44 consecutive years Turkey recognized and respected the above rule of 10 nautical miles, since 1975 she has contested it with constant violations of Greek Air Space. Formations of Turkish fighter planes, often with missiles on board, not only violate this section of Greek air space now contested by Turkey between 10 and 6 nautical miles, but also penetrate deeply beyond 6 nautical miles, in other words into Greek air space which Turkey has recognized, often overflying Greek islands. Here it should be noted that, in conformity with international procedures, Greece has notified her legislation on national air space without delay in order to see international legal consequences and more specifically with respect to her neighboring countries. Indeed, on the basis of her obligations in accordance with Annex F on aeronautical maps of the 1919 Treaty of Paris on Air Traffic, Greece has submitted maps of her air space, designation of air corridors, as well as the transit points on her northern and eastern borders to the CINA (International Air Navigation Committee). These maps show the outermost limits of Greek air space as 10 nautical miles. With the implementation of Annex 4 of the 1944 Chicago Treaty on Aeronautical Maps, the first ICAO aeronautical maps printed in 1949 were based on the CINA ones. In their second edition in 1955, new aeronautical maps were incorporated, which Greece then published. The outer limit of Greek national air space was clearly designated as 10 nautical miles. It should be stressed that the respective Turkish aeronautical maps also included the outer limits of Greek air space as 10 nautical miles. During the Regional Air Navigation Meetings in Paris (1952) and Geneva (1958) the Athens FIR limits were determined, based on the outer limits of its coastal zone and its air space. In the Minutes of the 1958 Regional Meeting, moreover, clear reference is made to the Greek aeronautical maps communicated to ICAO in 1955 and which show the limits of Greek air space at 10 nautical miles. Turkey participated in these Regional Meetings without raising any objections to the 10 nautical miles set for Greek national air space. The map of the European Air Navigation Plan was also approved at these Meetings. Further official notification of the 10 nautical mile limit, as stipulated in the Presidential Decree of 1931, was included in the Aeronautical Information Handbook that was published in accordance with Annex 15 of the Chicago Convention by the competent Civil Aviation Authorities. (AIP Greece, Vol I, RAC 0-1.2.1). Finally, the 10 nautical miles regime has been in force since 1931, when the relevant Presidential Decree was issued and uniformly applied, without its legal basis being in any way contested by third countries. Turkey's recent challenge to the extent of Greek air space is obviously part of a more generalized Turkish political objective to review the status quo in the Aegean. A problem for both Cyprus and Greece will be Turkey's impending membership on the UN Security Council. Letters of protest to the Council on these topics will get even less play than they do at present. Perhaps that helps explain Downer's position. To be continued.